growing plants from seeds is a very inexpensive and self satisfying way to make your garden grow! but the basics are generally all the same. For individual requirements, refer to our Plant Care directories, or the seed package. Start your seed growing process by assembling all the materials you will need in your work area. You will need containers with provisions for drainage. This may be CLEAN plastic pots, trays, or peat trays. This can be purchased at any good nursery supply. you might consider purchasing a waterproof soil heating cable or mat. These are normally factory set to keep your soil at 72 degrees but many also have variable thermostats. Always follow the manufacturers directions. it is also a good idea to use permanent ink on waterproof labels, and keep a log book. 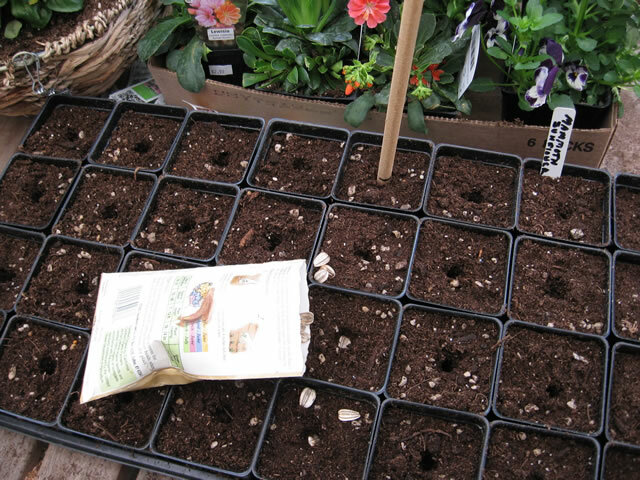 Fill your pots, packs or flats to within ¼" of the rim with your planting medium. Moisten the growing medium by placing the flat in a pan of room temperature water until it is thoroughly wet. Unless you are using a sterile planting mix, it is advisable to then redrench with solution of ½ teaspoon of Benomyl fungicide per gallon of water to prevent 'damping off' disease. Allow the excess water to drain from the pots/flats. Tamp them lightly to pack the medium and remove any air pockets. It is very important that you make sure that the seeds you plan to grow don't have any special pre-sowing requirements before. Some seeds won't germinate unless they are sown while fresh, or will only sprout in the dark or in the light. Other seeds may require soaking in room temperature water for a few hours.. or days. Some seeds have hard seed hulls and may require scarification. Scarification involves scratching or nicking of a seed's shell to facilitate germination. It is a good idea to do your sowing in stages so that in the event of disaster you have a second chance. Depending on the size of the seed you may have to create a seed 'trench' or punch a row of small holes with a dibble stick. The rows should be at least an inch apart. Planting depth is critical. A rough rule of thumb is that the planting depth is one or two times the diameter of the seed. Most very fine seeds should not be covered at all, nor should seeds that require light for germination. Pelleted seeds should not be covered. Merely press them into the surface of the soil mix. Refer to our Plant Care directories, or the seed package for this information as well as other requirments. using care to be sure that they are not crowded. This will ensure room for growth as well as good light and air circulation to the seedlings as they develop. It will also make it easier to transplant the new plants when the time has come. Now you should create a miniature greenhouse environment for the pots or flats. This can be done by placing the flat inside a sealed plastic bag, using small stakes to hold the plastic from actually resting on the soil mix, or actually building a mini house with a coat hanger frame and poly film. An old aquarium works very well for germinating. This greenhouse environment will almost eliminate the necessity of watering the bed again before the seeds germinate. Be sure to keep an eye on it though, Never let the soil mix dry out completely! Place your flat in a warm area where it will get good light but not direct sun. depending on what you are growing, so patience will have to be on of your virtues. Once the seeds have poked their little heads up, remove the greenhousing and gradually move the flat into brighter light or full sun. Your seedlings will be quite tender and fragile at this time, and a radical lighting or temperature change can be disastrous. At this stage, the seedlings have underdeveloped root systems, so watering is critical so check on them daily. The potting medium must remain moist, but never wet or soggy, because this will prevent oxygen to the roots and drown your new plants. Bottom watering is always best at this point because spraying can dislodge the plants and water on the leaves may lead to fungus attack. Temperatures should be kept at about 70°-75° (higher for some plants). Once the first true leaves (the second set of leaves to emerge) develop, you can begin to lightly feed your plants. Up until this time the seedlings have been being nourished from the seed itself. using a very diluted ¼ strength mix of an all purpose plant food once a week. When the plants have reached about 3 inches you can begin to water and feed the plants from above. When the plants have deveoped 4 true leaves, it is time to thin and transplant them into pots. where they may remain until they are ready to be planted in their permanent home. Always water plants thoroughly prior to any thinning, repotting or transplanting. Use the handle of a spoon as your shovel to remove the seedlings from the pot or flat, and very gently separate them, being careful to do as little damage to the roots as possible. Always handle a seedling by the leaves and NEVER by the stem. Even slight pressure can permanently damage the stem, whereas the plant will grow another leaf if it is damaged. Move the plant to the new pot, gently dropping the roots into a pencil size hole which you have ready. Set the seedling so that it is a tiny bit deeper than the level it was previously growing at. Gently press the medium around the roots. It is normal for a certain amount of wilting to occur after transplanting, due to some root damage and general plant shock but he plants should recover quickly. Keep the plants in good light for several days but not full sun. Gradually increase the light intensity. If the plants begin to get tall and spindly, they are not getting enough light and should be moved to a brighter spot. Water when necessary to prevent wilting. The medium should be kept moist but never wet or soggy. Light feeding can be done weekly at ½ the fertilizer's recommended strength. The final step is hardening off or acclimatizing the plants to the outdoor world. During this process, make certain that the plants are kept well watered. Move your trays or pots of plants outdoors to a shaded, sheltered area. When the temperature begins to drop at night, bring them back indoors. After doing this for 2-3 days put them into an area where they will receive a half day of sun. Bring them in at night if it is expected to get cold. Two to three days later let them have full sun (if they are sun lover plants). After this hardening period your new plants are ready to move into their permanent position in the garden. because a slug with an attitude can virtually eliminate all of your hard work in a matter of hours.